Citing this page: R. Antonacci, et al. 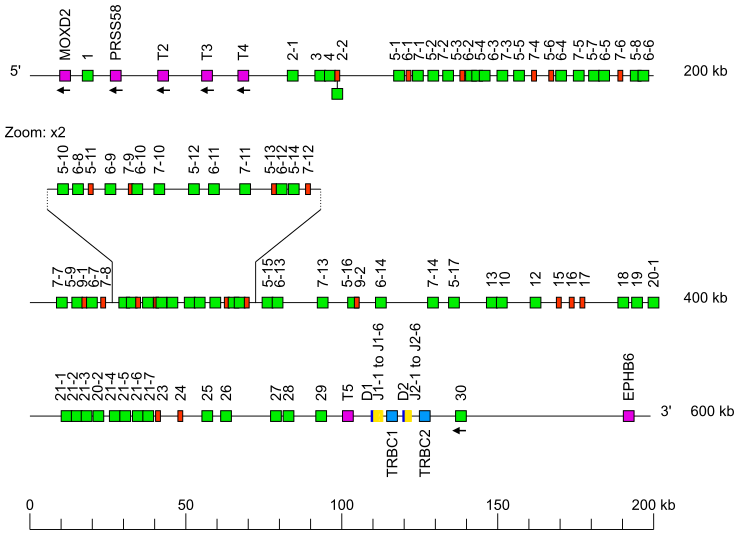 Immunogenetics 66:255-266 (2014) PMID: 24500788. IMGT/LIGM-DB: IMGT000032 (539992 bp) and S60737 (2601 bp), rabbit (Oryctolagus cuniculus) TRB locus. The rabbit (Oryctolagus cuniculus) Locus representation is Fig. 4 modified from: R. Antonacci, F. Giannico, S. Ciccarese, S. Massari. Genomic characteristics of the T cell receptor (TRB) locus in the rabbit (Oryctolagus cuniculus) revealed by comparative and phylogenetic analyses. The original figure was kindly provided by Salvatrice Ciccarese with permission from Springer.